Situated where the Ganges emerges from the Himalaya, Haridwar (also called Hardwar), along with the better known Rishikesh is one of Uttarakhand’s holiest Hindu cities. Pilgrims flock here in their droves to bathe in the all cleansing River Ganges, to wash themselves of their misdemeanours and be blessed by the holy river. Despite it’s numbers of domestic visitors, the purpose of their visit give Haridwar a calmer and more reverent feel than its better known counterparts. 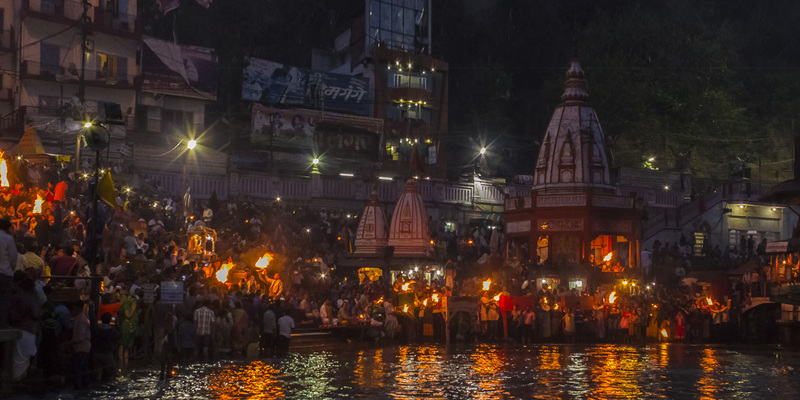 Here, as in Rishikesh, every evening the river comes alive with flickering flames as ceremonies are performed, pujas are done and floating offerings are released onto the Ganges.